Copper engraving with original outline hand colouring. Overall sheet size: 55.1cms x 74.1cms; image size: 406mm x 675mm. 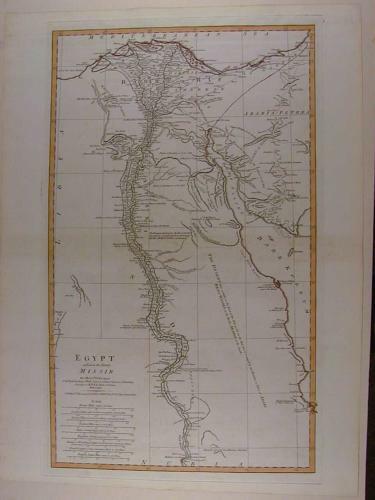 9 scales of distance beneath the title; river Nile shown to Assuan; in right hand half the blank space is designated: The Desert that extends to the East of the Nile as far as the Red Sea is occupy'd by two Families or Tribes of Arabs Beni-Wassel to the North, Arabde to the South. Slight tinge of browning to centrefold else very good condition.